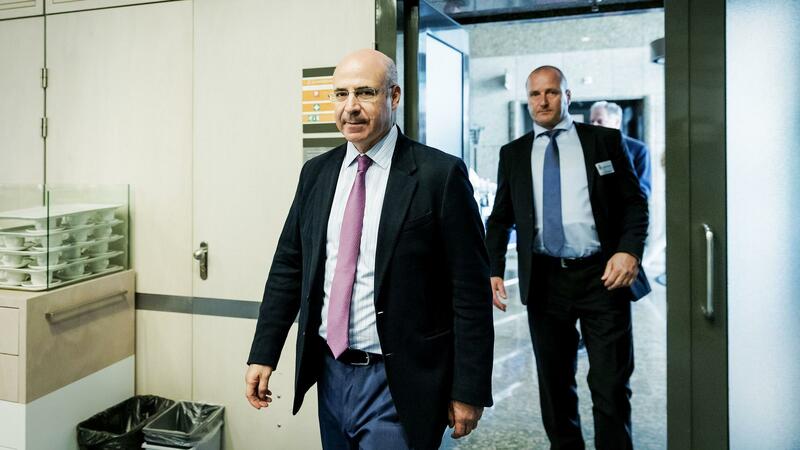 Bill Browder, a former Moscow financier turned anti-Kremlin activist, prepares to speak with European officials about the Magnitsky Act last week in The Hague. For a brief time Wednesday, Bill Browder was in Spanish custody. The London-based businessman and vocal Kremlin critic had been arrested in Madrid on what Browder says was a Russian warrant issued through Interpol. Formerly a major investor in Russia, Browder has spent the better part of a decade waging an international crusade against corruption in Russian President Vladimir Putin's government. He pushed for the 2012 Magnitsky Act, which punished several prominent Russians with U.S. sanctions, and lately he has spoken frequently of Russian attempts to influence the domestic affairs of other countries. In fact, Browder said it was this "mission" that brought him to Madrid — until, that is, Spanish police detained him. Authorities released Browder just a few hours later, but not before he fired off several tweets chronicling the arrest as it unfolded. "Urgent: Just was arrested by Spanish police in Madrid on a Russian Interpol arrest warrant," he announced to his followers Thursday morning. "Going to the police station right now." He even tweeted a picture of the apparent warrant from the Spanish central government, seeking his arrest for fraud, which a Russian court has convicted him of in absentia. He was released just a few hours later, after remaining in custody "for the minimum necessary time," the Spanish National Police Corps said. It was not long before Browder hopped on a plane out of Spain and put the arrest in his rear view — but questions continue to eddy around why, exactly, the activist and commentator was arrested in the first place. Browder asserted that his detainment came because Russia had obtained an active Interpol Red Notice, or a formal request that one Interpol member country arrest a suspect based on a valid warrant issued by another member country. He noted that Thursday's dust-up was, in fact, "the result of a SIXTH Russian arrest warrant using Interpol channels." Russia allegedly tried so many times to arrest him, in fact, that Browder wrote a whole book about those attempts, titled Red Notice. "It's all very scary," Browder told NPR's Rachel Martin last fall. "It's not just arrest. They could try to assassinate me on the street. They've made these threats, and so I am genuinely Putin's No. 1 foreign enemy, and they'd like to wipe me out one way or another." Spanish law enforcement said officers let Browder go after it was "verified by INTERPOL Spain that the arrest warrant issued by the Russian authorities for tax evasion was invalid." "An arrest warrant has a date limit and when that expires, it must be deleted from the computer programme and in this case Interpol hadn't deleted it," a police spokesperson clarified to Agence France-Presse. Yet Interpol denies that there was even an official Red Notice to begin with. "There is not, and never has been, a Red Notice for Mr Bill Browder," the international law enforcement agency told NPR in a brief emailed statement, adding that "Mr Browder is not wanted via INTERPOL channels." The agency, which has 192 member countries, did not clarify further. While Russia has "repeatedly repeatedly requested Mr. Browder's arrest through Interpol," The New York Times reports, "... its requests have been refused repeatedly. In 2013, in a rare and sharp rebuke, Interpol said Russia's request to arrest Mr. Browder 'was of a predominately political nature.' "
It remains unclear, then, how the warrant surfaced and drew Spanish law enforcement's attention Wednesday. At any rate, Browder landed in London safely later Wednesday, noting that he was "no worse for the wear." "Getting ready for more Magnitsky sanctions advocacy next week," he tweeted.